Valentine’s Day Sock Coupon from Sock Panda! Sock Panda is one of the best sock of the month clubs that we’ve covered several times here on SockClubs.com. It’s one of the best sock subscription sites and we’ve listed it here in our list of popular sock subscriptions! A great Valentine’s Day gift – for him or her – is the gift of socks. And nobody likes just one pair of socks. 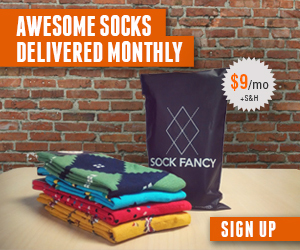 How about the gift of a new pair of socks each month? Sock Panda promises to do just that. Previous Article Sock Fancy Reviews: The best subscription sock club?